“I Love Lucy,” one of the most well-known shows of all time, has become a true classic since its premiere 64 years ago. 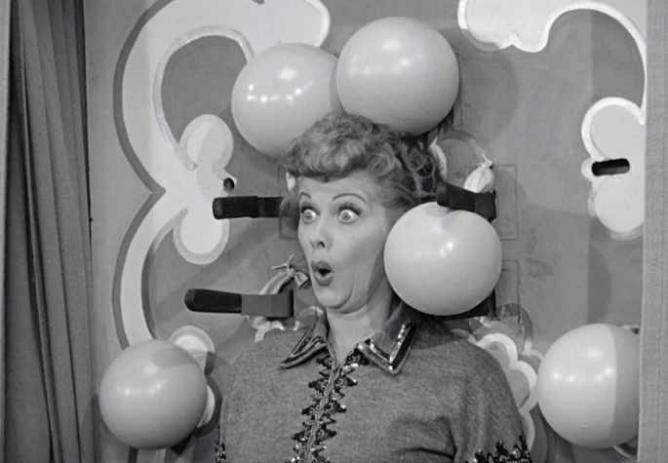 The show ran from 1951 to 1957 and was groundbreaking in many ways, including Lucille Ball’s rightful place as the world’s most popular television comedienne. We’ve compiled a list of the 10 most iconic moments, some of which you may recognise even if you haven’t seen the show. When Lucy goes behind hubby Ricky’s back and lands a TV commercial advertising “Vitameatavegamin,” a health serum, she runs into a bit of trouble. As if the name weren’t hard enough to pronounce already, the serum’s 23% alcohol content has Lucy slurring her words and mixing up her facts, leaving her completely wasted by the end of the shoot. Although it is never revealed what happened with the Vitameatavegamin commercial, we sure do hope that they were filming during Lucy’s practicing when she did one flawless take. 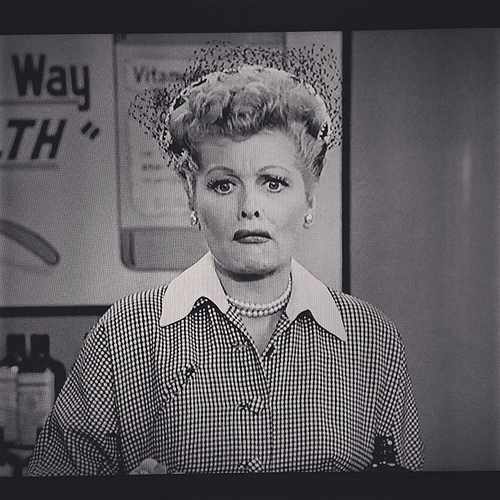 Fun Fact: The cast and crew used apple pectin to act as Vitameatavegamin, which Lucy later said was sickening to drink so much of. 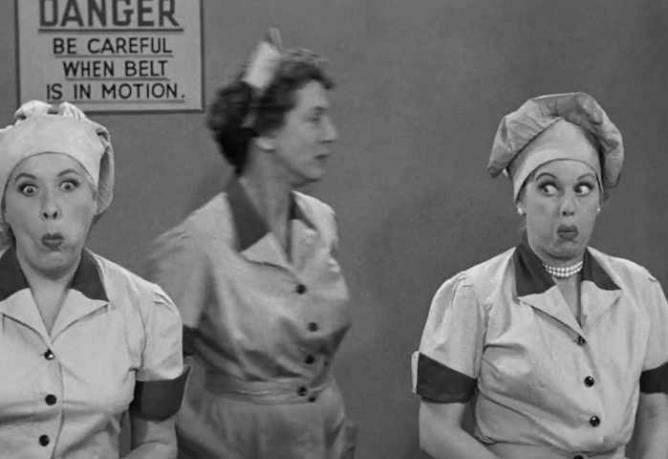 Perhaps the most famous “I Love Lucy” episode ever, season two’s “Job Switching” embodies Lucy and Ethel’s friendship at its best. When their husbands, Ricky and Fred, suggest that housework is easier than any real job, the men and women switch roles for the day in this comedic battle of the sexes. While Ricky and Fred drastically fail at doing laundry and butcher their home-cooked meal, Lucy and Ethel find themselves in a candy factory trying to keep up with its increasingly speedy conveyor belt. Needless to say, they wind up with stomach aches! When the Ricardos and Mertzes finally arrive in Los Angeles for Ricky’s lead role in Don Jaun, Lucy, Ethel, and Fred decide to have lunch at the famous Brown Derby in hopes of having a star sighting or two while Ricky heads to the studio. 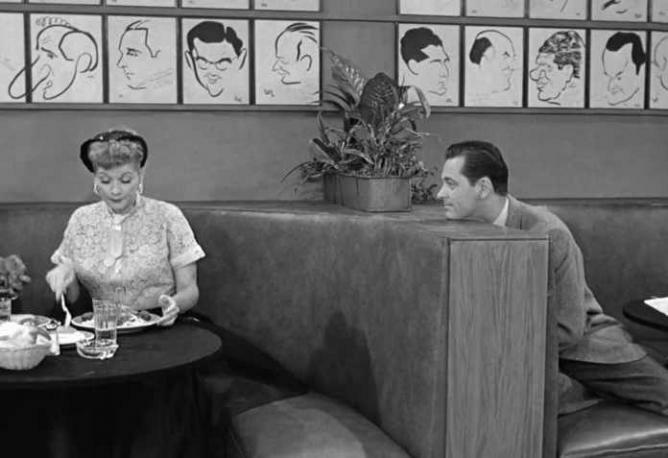 When Lucy spots William Holden and Eve Arden at the table behind, she is so starstruck that she ends up blatantly staring at Holden through a potted plant. When the actor is annoyed by this, he sees how Lucy likes being stared at while trying to enjoy a meal. When Lucy and Ethel decide to take a bus tour of movie stars’ Beverly Hills homes, Lucy ends up stranded in Richard Widmark’s house after trying to steal a seemingly perfect grapefruit from his backyard. Fun fact: Lucille Ball’s actual house was used in the location shots for this episode. She and Ethel are seen walking up to the house as they get off the bus to visit Widmark’s home. Lucy competes with her friend Carolyn Appleby over invitations and scheduling for Little Ricky’s fifth birthday party and promises to produce Superman, after learning that Ricky’s friend (and Superman star) George Reeves is in town. When Reeves cannot make the party, though, Lucy is forced to make other plans. 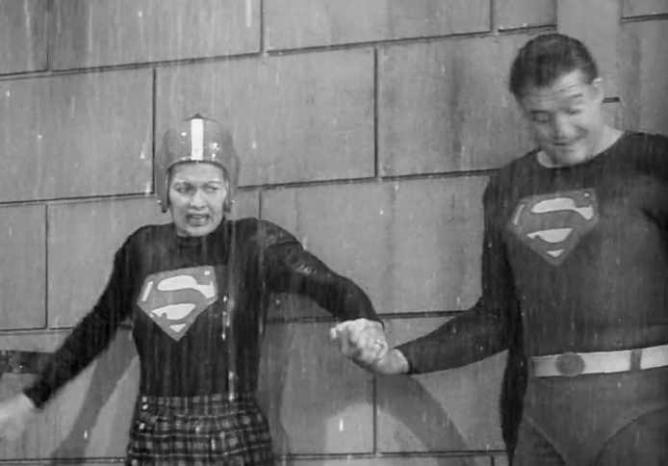 When she tries to impersonate Superman, costume and all, at the last minute, Lucy winds up locked out on the balcony with only a few maniacal pigeons keeping her company, while the “real” Superman (played by Reeves) shows up to the party and to save the day. Spread over two episodes (one simply was not enough! ), Lucy and Ethel have an unforgettable run-in with John Wayne’s footprints and later John Wayne. 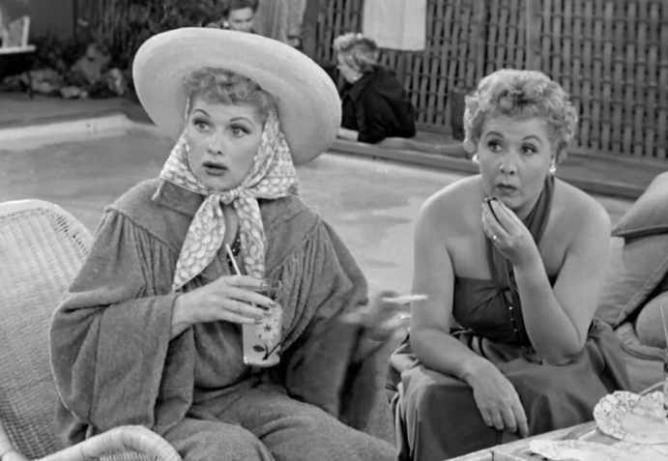 After complaining that she does not have enough “Hollywood souvenirs,” Lucy convinces Ethel to help her pry John Wayne’s footprints out of the ground on their trip to Grauman’s Chinese Theater, and they consequently break the cement block back at their hotel. Ricky receives a phone call from the police saying that they intend to prosecute Lucy and Ethel if the footprints are not returned intact, but since the girls have broken them, that is obviously impossible, so Ricky manages to convince John Wayne to produce a new set…or several. After tirelessly practicing for the birth of Little Ricky, all seems to be calm and under control. Ethel, Fred, and Ricky have rehearsed their various roles and have them down to a tee. That is, until the moment actually arrives, when Lucy simply utters, “It’s time.” As so often happens in reality, chaos ensues, and all forget what they have to do. The group finally makes it to the car only to realise that Lucy, the most important ingredient in this whole thing, has been left behind. When the gang is in Los Angeles for Ricky’s film debut, Lucy’s friend Carolyn Appleby visits from New York, and, after hearing Lucy brag about all of the movie stars she’s befriended during their time there, expects to meet a few of them. Rather than admit to her friend that she does not actually know these celebrities, Lucy takes advantage of Carolyn’s bad eyesight and dresses up as Clark Gable, Marlon Brando, and Harpo Marx. All is well until the real Harpo Marx appears and Lucy does the famous “Mirror” routine with him! After both getting into fights with their husbands, Lucy and Ethel decide to take off to Palm Springs for a few days in retaliation. Once there, both Lucy and Ethel and Ricky and Fred realise that they are unable to rid themselves of the habits that annoyed their respective spouses, and before long, they miss each other. It takes a sad story from Rock Hudson, whom the ladies meet in Palm Springs (as you do), to reunite America’s favorite couples. Fun fact: Before the initial coin toss to determine who would go and who would stay, Lucy tries to trick her hubby by saying, “Heads, we go. Tails, you stay,” the same scheme she apparently said to Ricky to trick him into marrying her. Tired of Lucy’s little, white lies, Ricky, Ethel, and Fred make a wager of $100 that Lucy cannot go 24 hours without telling even the smallest fib.When Lucy and Ethel go to play bridge at their friend Carolyn Appleby’s home, Ethel takes advantage of the bet, forcing Lucy to share her honest opinion of Carolyn’s hideous new Chinese Modern furniture. Once Ethel tells their friends of the bet, they all secretly collaborate to ask Lucy her age, weight, and natural hair colour, to name a few. When Lucy answers without hesitation and discovers that she likes the freedom being honest gives her, the wager backfires, as Lucy begins to be honest with Ricky and Fred about their character faults. Lucy ends up back in the hot seat before long, though, when she lies about speaking Italian and winds up being an Italian knife-thrower’s assistant.